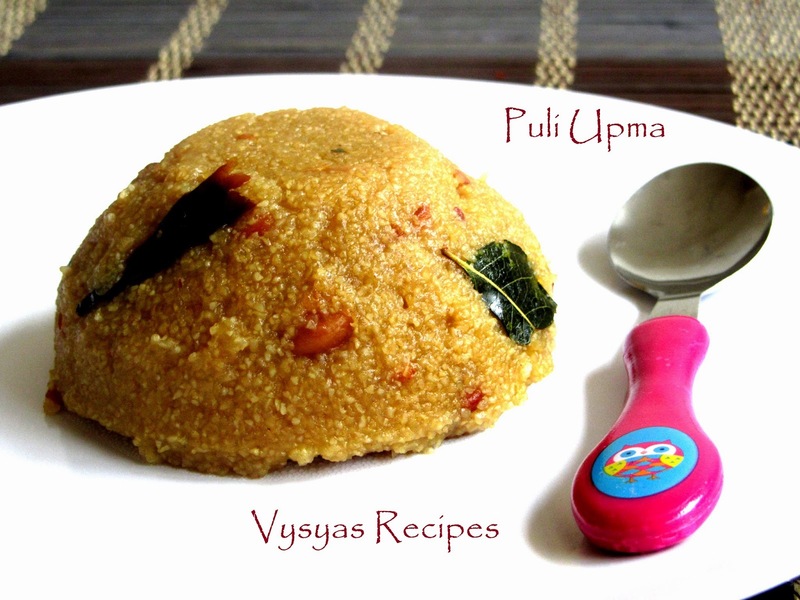 Puli upma is a distinct upma recipe flavoured with three tastes. tanginess from tamarind, mild sweetness from jaggery and spice&flavours from red chillies and peanuts. All these ingredients makes the upma a unique taste. simple recipe, easy to make at busy mornings.Bachelors can try this simple recipe. This is an authentic recipe, make at our homes. Soak the Rice Rava for one hour in water. soak the tamarind in 1/2 cup of water, for minimum half an hour, then squeeze the tamarind, retain the juice and throw the pulp. Heat the oil add mustard seeds ,when it start spluttering add chana dal,urad, red chillies, curry leaves, peanuts. saute till dal's turn golden brown colour. Then add 3 cups of water, and 1/2 cup of tamarind water. Add jaggery, turmeric and salt. mix well. When water comes to a rolling boil, add rice Rava stir well. it should not have any lumps. cook in a medium flame for 8 - 10 minutes, till the water is absorbed and it comes to upma consistency. serve hot.